The New York Times has an article on the American Jewish Joint Distribution Committee’s putting its archives online. The organization, which is known as “the Joint” (except perhaps among old-school gangsters) will be making its massive archives of photographs (100,000) and information (containing 500,000 names) available with a searchable index. The Times has a slideshow sample of some of the photographs, including pictures of Leonard Bernstein conducting “Rhapsody in Blue” for concentration camp survivors with an orchestra consisting of their fellow survivors and one of Marc Chagall and Der Nister among other teachers at a Moscow school-camp for Jewish refugees (see photo, Chagall is in front and Der Nister sits at his right). 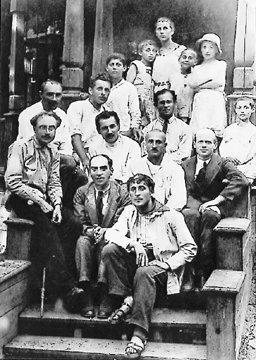 Many of those photographed with Chagall that day would later be sent to the Gulag by Stalin, with some being killed on the Night of the Murdered Poets. Another Wandering Jew in the news is Joseph Roth, who is featured in a double book review by Simon Schama in The Financial Times. Schama reviews Roth’s recently published correspondence as well as Wandering Jew: The Search for Joseph Roth by Dennis Marks, who was recently interviewed on literalab. Reviews of both these books are forthcoming here as well. The Budapest Business Journal provides an optimistic view on the translation of Hungarian literature into foreign languages. I’m not sure if their take on the American market qualifies as optimistic though, as besides the success of László Krasznahorkai, whose Satantango is about to come out, they cite two catalysts for getting Hungarian books into American readers’ homes. One is a movie tie-in, though I’m not sure all that many Americans will go to see Béla Tarr’s The Turin Horse (with a screenplay co-written by the director and Krasznahorkai) or István Szabó’s The Door (adapted from a novel by Magda Szabó). The second catalyst mentioned is getting a mention on Oprah. The chances of the words Satantango coming out of Oprah’s mouth strike me as being equal to me starting my own TV talk show. I recently wrote about this Hungarian writer’s Central European folk surrealism and linked to a translated story of his. Now, courtesy of the latest issue of Cerise Press comes an excerpt from Lázár’s Benny Bean and the Magic Nectar translated by Andrea Németh-Newhauser (paired with the Hungarian original).